Camille Saint-Saens never seems to have had much luck with his sixth opera, Proserpine. Premiered in 1887, Saint-Saens was accused both of Wagnerisme and of taking too symphonic an attitude to opera (his Symphony No. 3 had just been premiered). By the time of the opera's revival in Paris in 1899, the Parisian public had heard real Wagner operas and tastes had changed. Unfortunately the opera's rather fustian libretto and plot seemed old fashioned. The piece has now been revived by Palazzetto Bru Zane and the recording issued in one of its admirable books published by Ediciones Singulares. 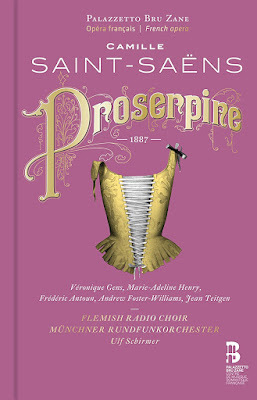 Veronique Gens sings the title role (a Renaissance courtesan), with Marie-Adeline Henry, Frederic Antoun, Andrew Foster-Williams and Jean Teitgen, the Flemish Radio Choir and Munchner Rundfunkorchester conducted by Ulf Schirmer. The rather old fashioned cast to the plot arises because Saint-Saens conceived an opera based on August Vacquerie's 1838 play Proserpine. The resulting four act opera underwent some changes from the play (the second act is entirely new and the number of deaths at the end caused problems). Saint-Saens wrote a work where each act has a very different character, and it is only on the final two that the drama really catches fire. Act One is set at one of Proserpine's (Veronique Gens) parties. She is in love with Sabbatino (Frederic Antoun) but knows that as a courtesan she can never be allowed to experience real love so is consistently cold to him. Sabbatino remains obsessed with her and is persuaded by Renzo (Jean Teitgen) to make one last approach to Proserpine, to get her out of his system before Sabbatino marries Renzo's sister. This fails, leaving both Prosperpine and Sabbatino angry. Act Two deals with Renzo's virginal sister Angiola (Marie-Adeline Henry) and her betrothal to Sabbatino. In Act Three Prosperpine and Squarrocca (Andrew Foster Williams) capture Renzo and Angiola, the furiously jealous Proserpine tries to force Angiola to abandon her engagement, but Renzo escapes and frees Angiola. In the short final act Prosperpine approaches Sabbatino and confesses she loves him; he rejects her and when she overhears Sabbatino and Angiola she attacks them. Failing, she stabs herself. Maybe with a bit of psychological depth the libretto might hold up, but we have too much of Angiola in Act Two, and she simply fails to catch fire, though Saint-Saens' writing in this act was very much admired at the premiere. Act One is rather diffuse and scene setting. Saint-Saens uses a lot of lyric dialogue and arioso here, accompanied by richly expressive orchestral textures. But Proserpine and Sabbatino's crucial scene simply fails to register strongly enough, though Gens is fluidly elegant and Antoun ringingly uptight. The passions that explode in Act Three seem to come out of nowhere. It is really with Act Three that the drama takes off and both Gens and Antoun, aided and abetted by Foster-Williams make stunning stuff of the closing scenes. But it is too little too late. Except of course, French 19th century opera does not work like that. The drama unfolds slowly and subtly, with many set pieces and to appreciate the opera you have to forget about our modern obsession with a quick progress to drama and follow the subtleties of Saint-Saens' writing. The role of Angiola is a case in point. Marie-Adeline Henry sings Angiola finely, but virginal girls are rarely interesting. The importance is the contrast between Angiola and Proserpine, the one setting the other off. But I suspect that Saint-Saens was far more interested in Prosperpine, though you do wish he had worked with a better librettist. Strong support is provided by the smaller roles sung by Mathias Vidal, Philippe-Nicolas Martin, Artavozd Sargosyan and Clemence Tilquin with the Flemish Radio Choir. Ulf Schirmer and the Munchener Rundfunkorchester have a wonderful time with Saint-Saen rich score. The complaints of his contemporaries about the over symphonic nature of the music seems strange to us nowadays, especially given the rich interest which the orchestra provides in this score. The accompanying book includes excellent background articles by Marie-Gabrielle Soret, Gerard Conde and Hugh J MacDonald along with Saint-Saens own thoughts on the opera plus full texts and translations. On disc is perhaps the best way to appreciate this opera. Veronique Gens really brings out the fascination of the role of Proserpine, and we can revel in Saint-Saens orchestral complexities without worrying too much about the fustian plot.